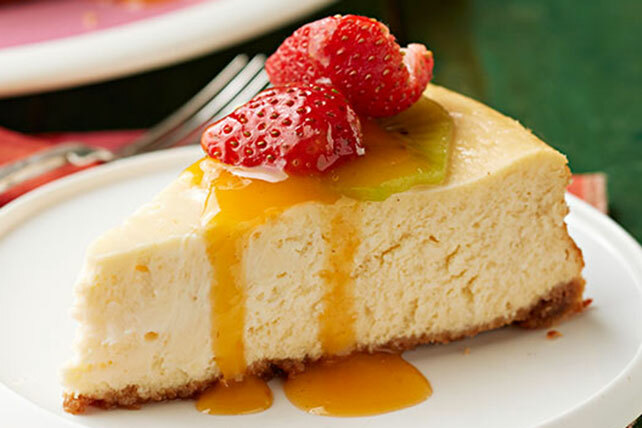 Passion fruit gets star billing in this luscious baked cheesecake, but strawberries and a sliced kiwi get credit for making it pretty. Mix graham crumbs, 3 Tbsp. sugar and butter; press onto bottom of 9-inch springform pan. Bake 10 min. Beat cream cheese, flour and 1 cup of the remaining sugar in large bowl with mixer until blended. Add eggs, 1 at a time, mixing on low speed after each just until blended. Stir in 1/2 cup passion fruit; pour over crust. Meanwhile, bring remaining passion fruit and sugar just to boil in saucepan on medium-low heat 15 min. or until thickened, stirring frequently. Cool completely. Cut kiwi into thin slices. Add to top of cheesecake along with the strawberries. Drizzle with passion fruit sauce. When making cheesecakes, it is important to not overbeat the batter. Passion fruit pulp and other fruit pulps can be found at the frozen section at most Latin grocery stores.